Nature's candy? Indeed, my friends. This is a great time of year to get a pint of delicious cherries. Too bad you have to eat around those lousy pits. Some folks use a cherry pitter, but you know how I hate those tools that only do one job. I usually pop cherries into my mouth, chew around the middle, then spit out the pit. 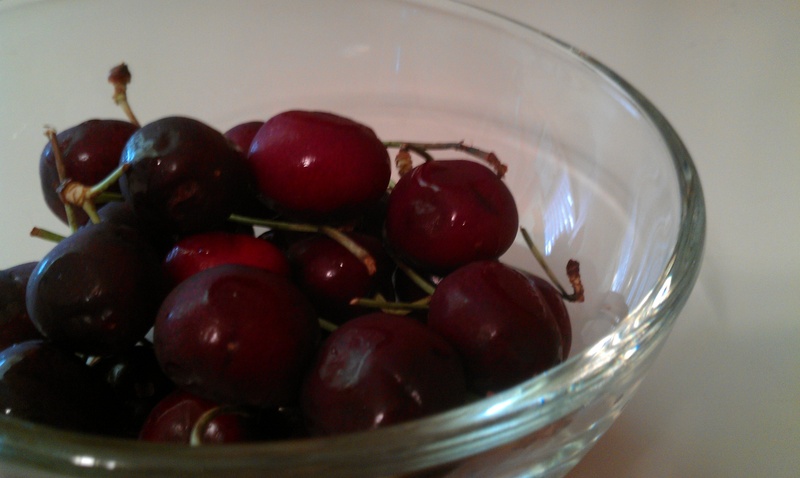 This summer, I wanted to enjoy my cherries minus the mess and spit. I found this blog post from the writers at The Kitchn, who recommend using a chopstick to de-pit a cherry. I don’t have any chopsticks laying around, but I found something similar in my kitchen — wooden skewers. Remove the stem of the cherry. Take the blunt end of the skewer and push it through the cherry. Use the spot where you took out the stem as a guide. That’s it. Pretty easy. Have a couple of small bowls handy — one for pits and one for cherries. It can get a bit messy, so put down some paper towels. I like my cherries plain or thrown in some yogurt or sangria. What’s your favorite way to enjoy pit-free cherries?